Well, the 36mm was shipped to me today. I'm more interested in the stowaway. Well that's the most welcome news of the day. 2019 looking to be a great year already. I read on the forum that you were on fire at the moment Eddie, have you been mixing the nitrous oxide with your nightcap recently? Awesome can't wait for it to be on site for sale . Hope you ordered enough pieces Eddie ? Oh man the 36mm looks awesome on the site Eddie. And yes the dial printing is amazing. Although it doesn't look like it in the picture, the dial is the same colour as the PRS-29 Air Ministry. Any thoughts on final production spec and availability, please, Eddie? Current plans are in the dedicated thread, here. Last edited by Joppers; 4th January 2019 at 13:14. See the dedicated 36mm thread. The watch looks great ! If anyone wants a 40mm version, one has surfaced on eBay for £275 or best offer. Everyone stop ordering so quickly - I want a PRS-25 40mm and I keep missing the 15 second order window before Eddie has to close ordering again.... sigh... one day. I'm curious and please forgive me for asking but what happened causing it to break? It's been long enough since I read the complaints that I've completely forgotten what I'm supposed to have against the hands Ignorance is bliss, truly. I like how the strap brings out the green of the lume, very nice. NICE. Green straps work well on the original mk 1 version I've always thought. That suits it well - what strap is that? Great combination. same as a few others be interested to know what strap it is? from watchgecko. Army green. Very comfortable. The Haveston has a different shape to the non buckle end, and of course their excellent sliding keeper. 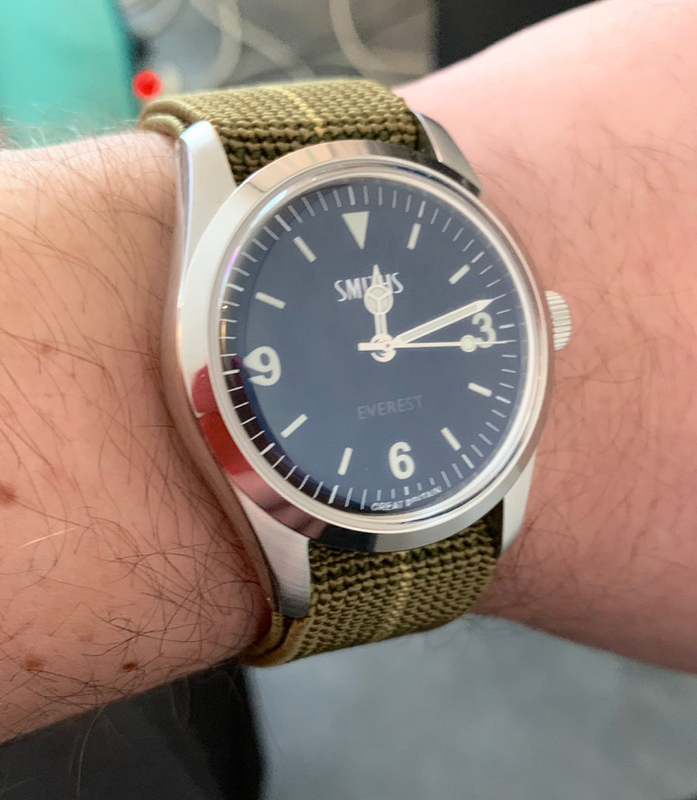 I'm still on the fence about canvas straps in general, due to reservations about their longevity, ie how the material would handle the abrasion and very regular cleaning that quality Natos take without any problems. Also how well the stitched pin holes hold up. FWIW the debate about the dimensions of the hands concerned the 36mm version, and the one pictured here is the 40mm. 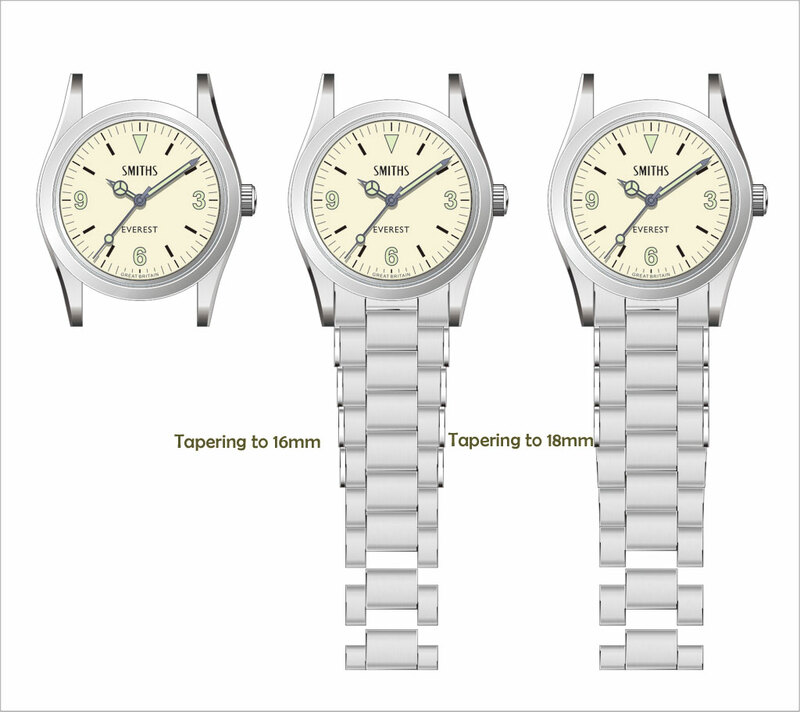 The proportions of the hands in relation to the dial are different on the two versions. Haveston have a Facebook page where owners have posted a lot of pictures of their straps on a very wide range of watches, useful to get an idea of how they look on different cases with different lugs. 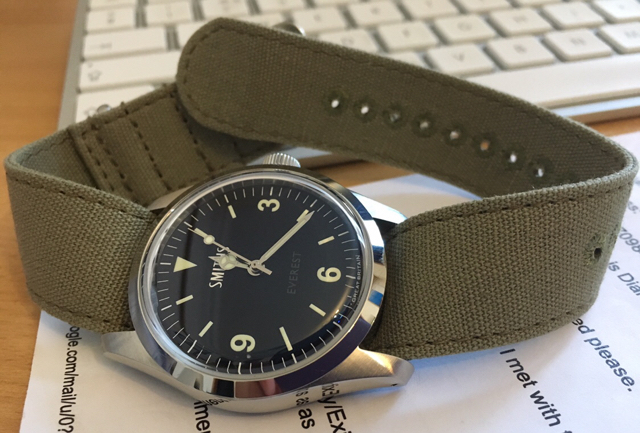 So you can definitely tuck back the excess end with the Harveston canvas strap? I have a couple of the nylon ones and do this all the time, so everything is contained under my wrist. I think I'll now add a canvas one to the mini-collection if this is the case. The point of the sliding keeper on a Haveston is that you don't fold and tuck any excess as the keeper slides along the strap to contain the free end. Look at post #27 here , where I put some pictures and measurements. I used my Fortress strap in the pictures, which is the "old" 2 piece style (I think they still have some left) but they are now a single pass through style with no "extra bit". The point of the sliding keeper on a Haveston is that you don't fold and tuck any excess as the keeper slides along the strap to contain the free end. Look at post #27 here , where I put some pictures and measurements. 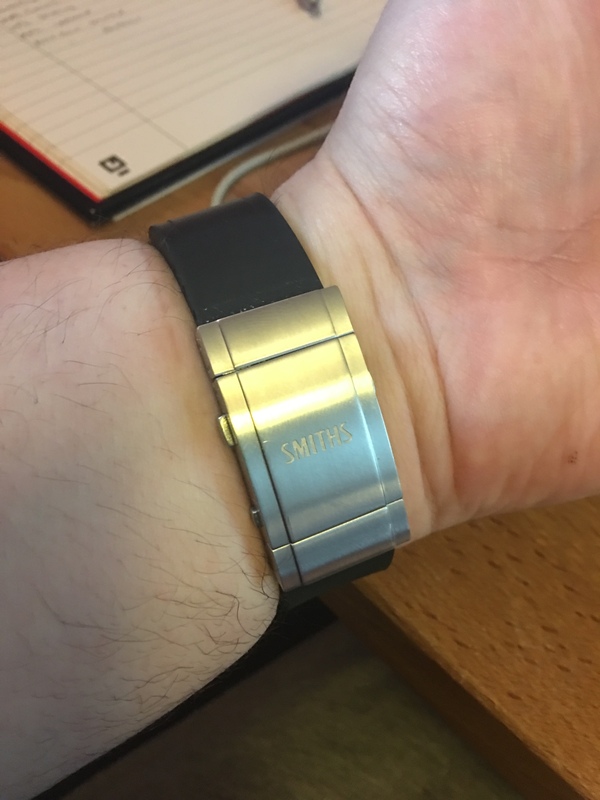 Thanks you had mentioned on that post that wrist sizes less than 6.5” would have to trim or tuck , so for people in that boat the sliding keeper may not be as helpful. My original question was whether the canvas material was sufficiently pliable to be folded back on itself in the same manner, or is it too stiff? Sorry for the hijack of the original post. Last edited by JerryTDM; 2nd February 2019 at 15:09. With the single piece pass through style of the Havestons you can position the free end out of sight. However it's such low profile compared to the bulk of tucking in that you may not need to. I was modifying the last link of the bracelet to work with the micro adjustments on the clasp(which I successfully managed to do), but I had clamped the link in my vice too tightly and slightly squashed the threaded hole for the screw. I’ve managed to fix it enough to wear it, but would like a new end link(clasp end). I'm wondering about those haveston strap, is it a one piece buckle (as per NATO spec) or does the buckle have a springbar ? I have three, all 22mm (Carrier, Fortress, M1936-B). They use a springbar, but they aren't drilled through. They are switched between an original Everest and a Voyager. Last edited by magirus; 5th February 2019 at 15:39. Now a newer style ratchet type clasp. I feel the original clasp matched its retro look well. If you're interested in more of a vintage feel you might want to look at the 36mm versions due later this year which will have rivetted bracelets tapering to 16mm, with traditional clasps. These are 'vintage white' dialled, one in the 1016-inspired Everest style and one based on design cues from Smiths' own heritage (the Everest Expedition model). See the dedicated thread for discussion of these. The current run of black-dialled 36mm Everests has the adjustable clasp but if it sells out then Eddie has said any further models will feature the new rivetted bracelet too. 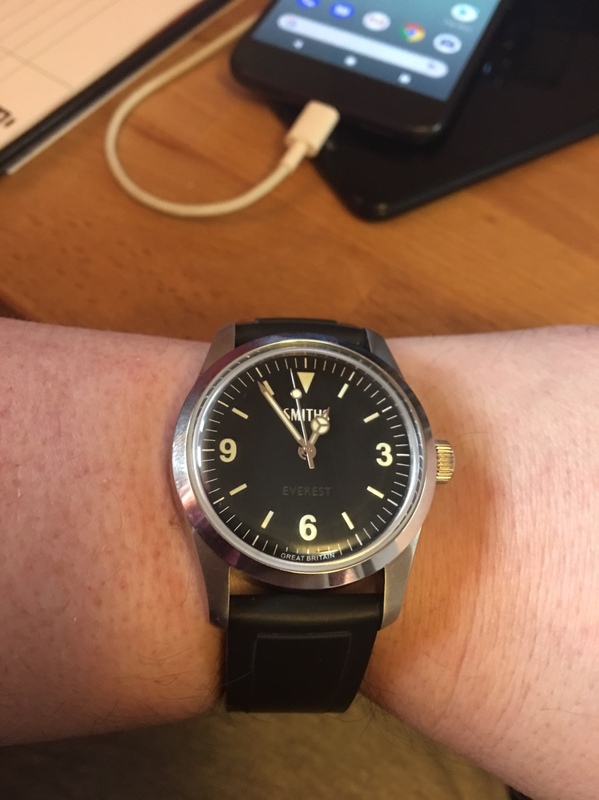 I don't have the larger Everest model but I'd have thought the adjustable clasp would be more appropriate on it than on the 36mm version. 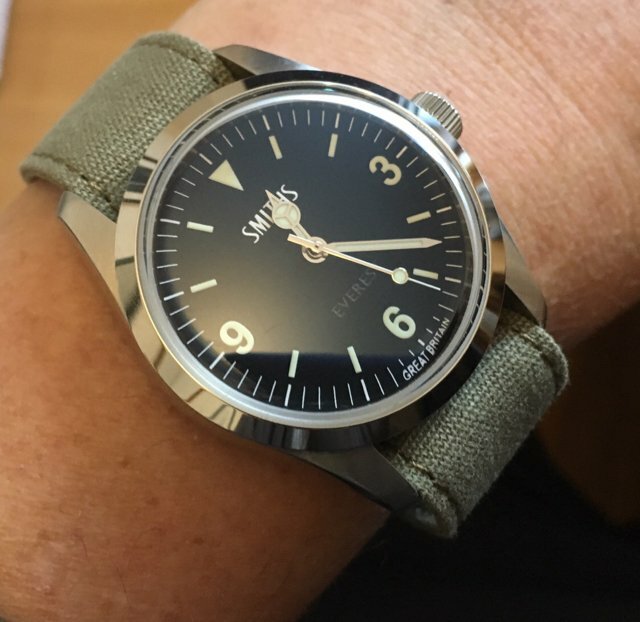 The clasp is really quite bulky, albeit well made, and I think it's fair to say that it hasn't had a very positive reception amongst owners of the 36mm watch. Last edited by TF23; 6th February 2019 at 00:25. I have three, all 22mm (Carrier, Fortress, M1936-B). They use a springbar, but they aren't drilled through.[...]. I ordered a prs-25 yesterday (and my first TF watch too ;) ), on pictures the clasp looks like the ratchet clasp StrapCode provides on some models (I have a Endmill with this clasp), let's see how it goes when I receive it ! A bit too small for my tastes. The riveted bracelet is quite retro looking, but a bother to change links. As far as I understand, also the next PRS-25 riveted bracelet will actually have a single screw per link in order to allow easy resizing operation. Had my 40mm for a few weeks now. Bought a few rubber straps and a buckle for my breitling, some of the straps are 22mm so thought I’d give this a go. Uses the smiths buckle from the original bracelet. A bit on the tight side but I can always let the buckle out a bit. Also have a rubber rally style that I might try as well. Far more casual than the bracelet but I do rather like it. Those who got the original PRS-25 with the acrylic glass - what are your experince with the acrylic glass?